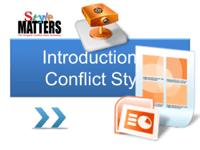 Nine slide Powerpoint presents lucid intro to conflict styles and the logic underlying them. Available in both Powerpoint and projectable PDF. Click below to view now!